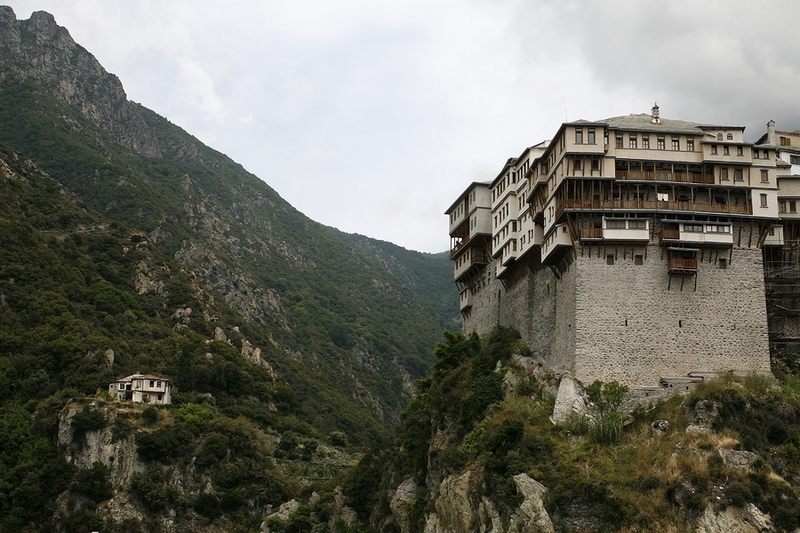 The Greek name for Mount Athos is Oros Athos, or the Holy Mountain. Although a visit to the area requires a permit and some advance planning, anyone can take a boat trip around the peninsula to take a look at the monasteries that dot the landscape. Some of them are in spectacular clifftop settings, which make you wonder how they were ever built, and towards the southern end of the peninsula is the imposing sight of Mount Athos itself, some 2030m (6660ft) high, the highest point in Halkidikí. 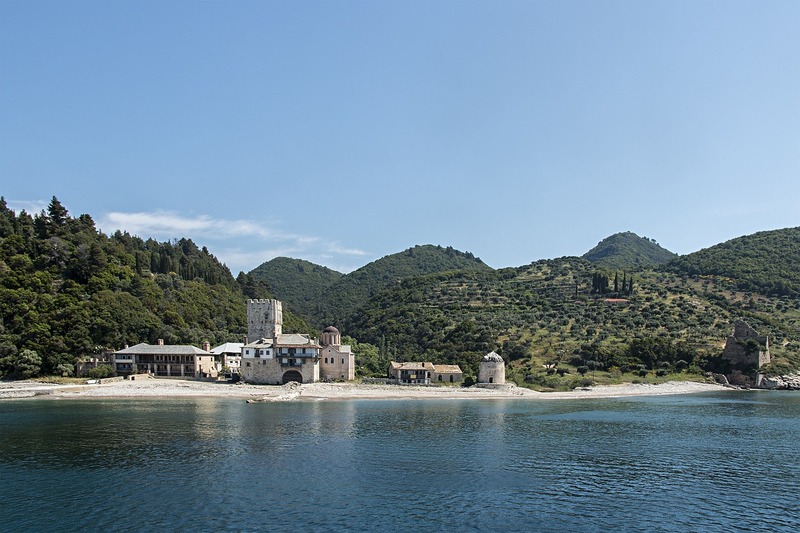 The first monastery was founded on Athos in 963 by St Athanasius, although by then the place was already regarded as a holy site which had been attracting hermits who retreated there to take up a contemplative life. 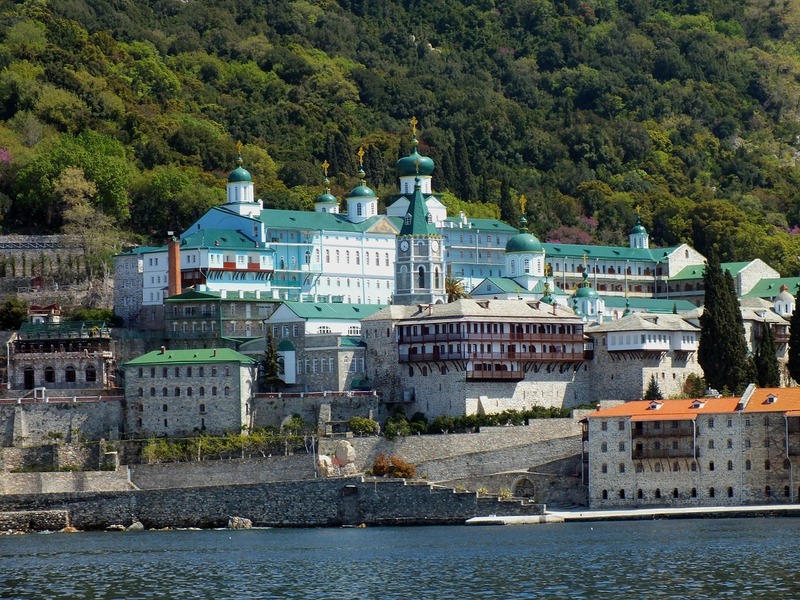 That first monastery was the Great Lavra Monastery, which is on a rocky outcrop at the very southeastern end of the peninsula and about as far from civilisation as you could get. It was followed by the building of other monasteries in the 10th and 11th centuries, until at one time there were 40 active monasteries with as many as 1000 monks in each one. The population today is nothing like that, with fewer than 2000 monks living in the 20 monasteries that are still inhabited. 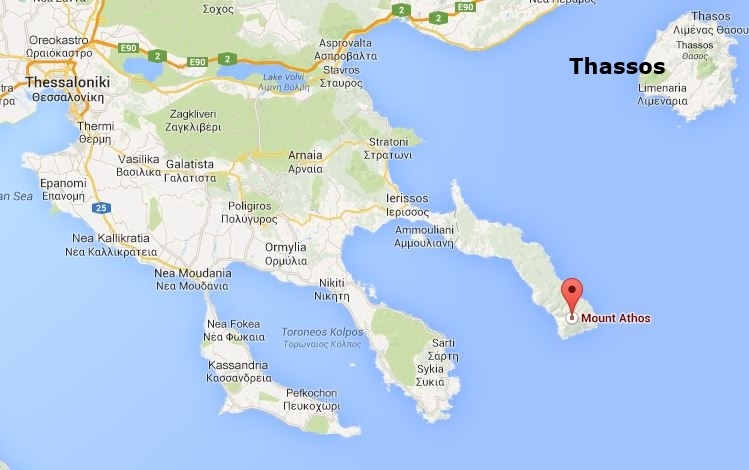 The one fact everyone knows about Mount Athos is that no female is allowed to set foot on the peninsula, and this has been the case since 1060 when the Emperor Constantine Monomachus of what was then Byzantium (modern Istanbul) issued an edict which banned all women from visiting Athos, which was reserved for the Virgin Mary alone. Not even female animals are allowed. The unique nature of Athos is permitted because the government of Greece made a decree in 1926 that created a Theocratic Republic on Athos, which had its own independence and was self-governing, but still a part of the Greek state. There have been occasional suggestions that this should be changed, but at the moment Athos still goes its own way. 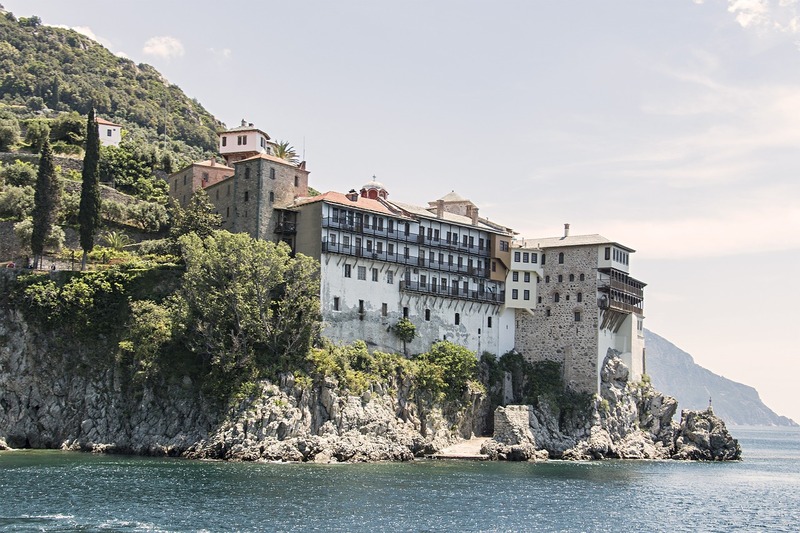 If you wish to visit Mount Athos, rather than merely observe it from the deck of a boat, there is a strict procedure involved. You must first obtain a letter of recommendation from the Greek Consul in your own country. You will need to show that you have a good educational, religious or cultural reason for wanting to visit. 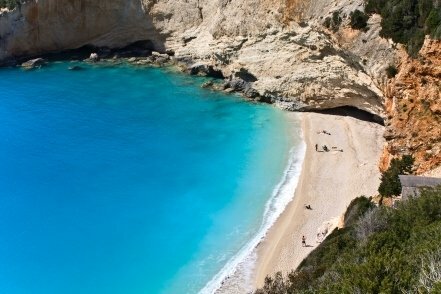 You must then send or take your letter to the Ministry of Foreign Affairs in Athens, or to the Ministry of Macedonia and Thrace in Thessaloníki, who are responsible for issuing the visitor permits for Athos, without which no boat will take you there. If your reason for visiting is approved, you then join the waiting list of applicants, as each Ministry only issues a few permits per day in order to control the numbers and give the monks the peace they desire. When a permit is issued it will be for a specific day, and allow a stay of up to four nights, although when you are on Athos you can apply for permission to stay an extra two nights. You must use your permit on the day for which it is issued, so anyone wanting to see Athos must be dedicated and also flexible with their travel plans. If you do get to Athos, you will see the strict regime under which the monks live. Services begin in the early hours of the morning, about 3am or 4am, although it is not necessary for visitors to attend. However, you will certainly hear the monks being called to prayer by the banging of a piece of wood known as a simándro, which is usually suspended from the ceiling near the entrance to the church. Only two meals a day are allowed, and there are a large number of fasting days when only one limited meal is served. When not praying, the monks spend their day at work in the fields or maintaining the monasteries.